National Football Museum President Sir Bobby Charlton was one of the inaugural inductees to the Hall of Fame in 2002. He signed for Manchester United as a 15 year old after being spotted playing in Northumberland. Over the next 20 years he made more than 600 appearances for the Old Trafford club. Charlton was a key member of the ‘Busby Babes’, the young side who won the 1956 League Championship and reached the FA Cup Final and European Cup Semi-Final before the Munich Air Disaster of 1958 claimed the lives of 8 of the team. Aged just 20 at the time, Charlton recovered and was identified by manager Matt Busby as the player a new team must be built around. A decade on, he scored the first and last of United’s 4 goals as he captained the side to their first European Cup victory, against Benfica at Wembley. 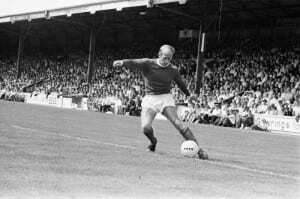 Reading 2-3 Manchester United, Watney Cup match at Elm Park, Saturday 1st August 1970. Bobby Charlton. Pic via Mirrorpix. 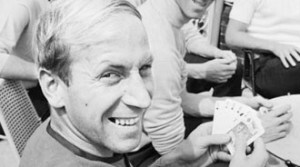 By this time Charlton was known all over the world: revered as one of the finest players in international football and player of the tournament at the 1966 World Cup. His sportsmanship and work ethic were as famous as his thunderbolt of a shot. It was claimed that Charlton was the best-known Englishman in the world, but the man himself remained modest and committed to playing the game. He retired from international football in 1970, with 106 caps. His record of 49 goals for England stood from then until Wayne Rooney moved past the tally in 2015, and as of 2016 his 249 strikes for Manchester United remains a club record. Sir Bobby Charlton's 'Player of the Tournament' trophy from the 1966 World Cup is currently on display at the National Football Museum.